RLJE Films will release the FANGORIA horror film PUPPET MASTER: THE LITTLEST REICH on DVD, Blu-ray and 4K UHD/Blu-ray combo on Sept. 25, 2018. Written by S. Craig Zahler (Bone Tomahawk, Brawl in Cell Block 99) and co-directed by Sonny Laguna (Wither, Animalistic, Blood Runs Cold) and Tommy Wiklund (Wither, Animalistic, Madness), PUPPET MASTER: THE LITTLEST REICH stars Thomas Lennon (I Love You, Man, “Reno 911!”), Jenny Pellicer (“State of Affairs”, “The Bridge”), Nelson Franklin (“Black-ish,” “New Girl”), Charlyne Yi (Knocked Up, This Is 40), Michael Paré (Gone, Eddie and the Cruisers), Barbara Crampton (You’re Next, Re-Animator), and Udo Kier (Downsizing, Brawl in Cell Block 99, Blade). 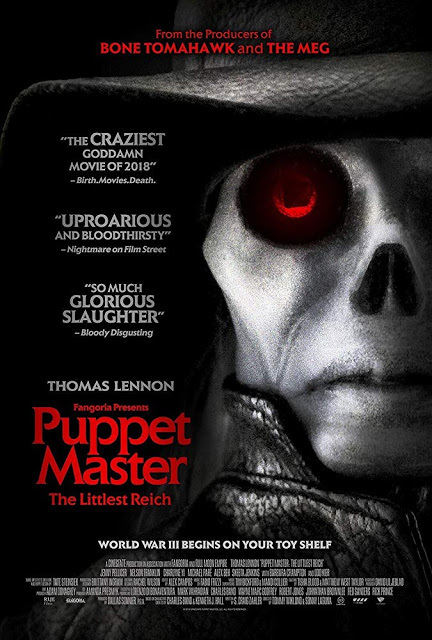 RLJE Films will release PUPPET MASTER: THE LITTLEST REICH on DVD for an SRP of $29.96; on Blu-ray for an SRP of $29.97; and on 4K UHD/Blu-ray combo for an SRP of $35.97.